Citation: Christy AJ, Sathialakshmi V. Unilateral two headed plantaris muscle-A rare variation. Int J Anat Var. Mar 2019;12(1):015-016. The plantaris muscle which is considered to a vestigial muscle in human beings may he absent in 10% of cases. The plantaris muscle consists of a small, thin muscle belly, and a long thin tendon that forms part of the posterosuperficial compartment of the calf. Together with the gastrocnemius, and soleus, they are collectively referred to as the triceps surae muscle. The anatomical presentation of the muscle is by the presence of the small belly with a long tendon. The insertion is at the medial surface of the tendocalcanuem and medial tuberosity of the calcaneum. Occasionally the tendon also joins with the Achilles tendon attaching itself to the calcaneum. The long tendon of plantaris also called as freshmen’s nerve, it is widely used as a tendon for graft in surgical procedures. Knowledge on Anatomy of the muscle is very essential for reconstructive surgeries. We present a rare variation of two head origin of plantaris muscle in a 45-yearold male cadaver during routine cadaveric dissection for undergraduate teaching. The variation was observed in the right posterior compartment of the leg. The plantaris muscle on the other leg also was appearing fleshy tendon fused with tendons of gastrocnemius. The right sided muscle had two heads with one head lying on the supracondylar line above the lateral condyle and second head lying on the oblique popliteal ligament. The popliteal artery was observed medial to the origin of plantaris. The tendon of the plantaris on both sides fused with the Achilles tendon and insertion was observed on the calacaneum. The tibial nerve, popliteal vein was also found medial to the point of origin of plantaris muscle. The total length of the muscle was 18 inches and the length of the tendon fused with gastrocnemius muscle was 11 inches. The width of the tendon was 3 inches. The length of muscle belly is 7 inches (Table 1). The plantaris is a vestigial muscle with a long tendon called as freshman’s Nerve. The muscle is absent in 7-20% of limbs [1-7]. It’s a thin slender muscle with a long tendon. The myotendinous junction occurs approximately at the level of the origin of the soleus muscle from the tibia in the proximal portion of the lower leg. The long thin tendon forms part of the medial border of the muscle belly as it courses between the medial head of the gastrocnemius muscle and the soleus muscle in the mid portion of the leg [8,9]. Plantaris is used as organ of proprioceptive functions and a powerful plantar flexor as it contains more muscle spindles  (Figures 1-3). 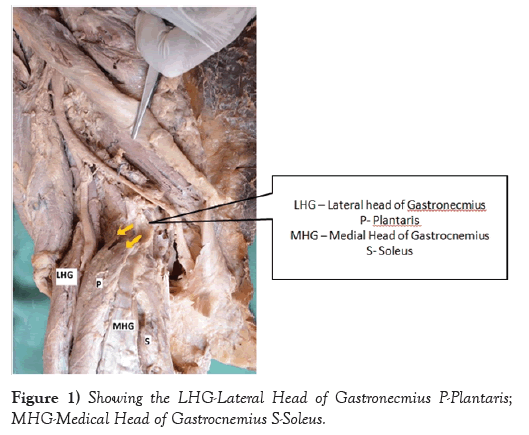 Figure 1: Showing the LHG-Lateral Head of Gastronecmius P-Plantaris; MHG-Medical Head of Gastrocnemius S-Soleus. Figure 2: The plantaris shown to its full length. Figure 3: Achillies tendon formation. The knowledge of plantaris muscle is important in the sports medicine as commonly involving the plantaris muscle tear during running, jumping, eccentric load placed across the ankle with the knee in an extended position. Forced, resisted plantar flexion can also cause severe pain due to the plantaris injury. Tear of the plantaris may be isolated or along with other muscles of the region like gastrocnemius, popliteus along with anterior cruciate ligament. The first surgically confirmed isolated rupture of plantaris was documented by Hamilton et al. in 1997 [11,12]. The treatment routine included pain relief through the use of cryotherapy and passive stretching, followed by a 5-min period of ultrasound therapy. Treatment then progressed to strengthening exercises are given by physiotherapist . The tendon is used for the repair and reconstructive surgeries. The muscle belly is small with long tendon attached to the calcanuem along with tendocalcaneum. The case presented has two heads. One head arising from the supracondylar ridge and the other head arising from the Knee joint capsule. The muscle was a fleshy belly with a long tendon joining the tendocalcanuem at the distal half of the shaft of the Tibia. The width of the tendocalcaneum is around 3 inches width so that it helps in transmission of weight to the calcanuem. The average length of muscle belly of plantaris is around 7-10 cm  but the reported case has a muscle length of 17.78 cm. The length of the muscle tendon was 27.9 cm. The tendon fused with the Achilles tendon. The knowledge of plantaris helps in vivid clinical diagnosis of muscle tear, tennis leg, and knee joint injuries . According to Dasler and Anson in 1943 the plantaris is absent in 8% of male and 5.8% in female [1,3]. The tendon of plantaris is used for reconstruction and repair surgeries. The knowledge of the variations in plantaris is essential for the orthopaedic surgeons in treating muscle injury and using the tendon as a graft for reconstruction. The belly with the tendon ratio is 1:44. The tendon of plantaris fuses with Achilles tendon and also involves in Achilles tendinopathy . The attachment of the plantaris tendon with the gastrocnemius is type 2 insertion according to Lukasz Olewnik et al. . Type 2 insertion is observed in 9% of the cases. The knowledge about the insertion and variations in the plantaris muscle is important in the surgeon’s perspective and the physical medicine perspective to treat the patient. The presence of interdigitations strengthen the argument that the plantaris muscle supplement the activity of the lateral head of the gastrocnemius muscle whereas the patellar extension suggests an involvement with patellofemoral dynamics and may play a role in the various presentations of patellofemoral pain syndrome [6,7]. The fusion of the tendon of plantaris with Achillies tendon can cause severe pain in Achillies tendinopathy. The knowledge about the variations in the insertion of planaris is essential for the orthopedicians, physiotherapists to treat the patients. These variations also gain importance in sports medicine which involves knee injuries; tear in the ligaments may also affect the tendocalcaneum when there is a fused tendon. Simpson SL, Hertzog MS, Barja RH. The plantaris tendon graft: an ultrasound study. J Hand Surg. 1991;16:708-11. Sharadkumar PS, Shaguphta TS, Rakhi MM. A rare variation of plantaris muscle. Int J Biol Med Res. 2012;3:2437-40. Daseler EH, Anson BJ. 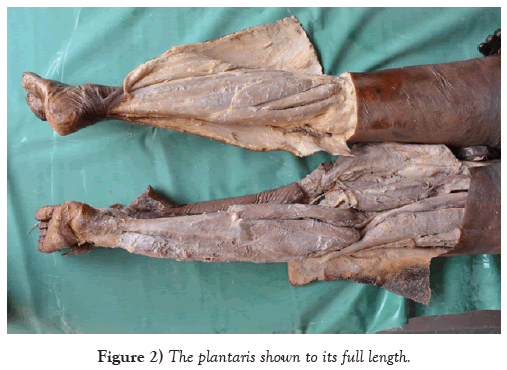 The plantaris muscle: An anatomical study of 750 specimens. 1943;125:822-7. Mohite S, Mohite H, More R. Morphological study of the plantaris muscle. Int J Health Sci Res. 2016;6:125-7. Olewnik L, Wysiadecki G, Polguj M, et al. Anatomic study suggests that the morphology of the plantaris tendon may be related to Achilles tendonitis. Surg Radiol Anat. 2017;39:69-75. Freeman AJ, Jacobson NA, Fogg QA. Anatomical variations of the plantaris muscle and a potential role in patellofemoral pain syndrome. Clin Anat. 2008;21:178-81. Olewnik L, Wysiadecki G, Podgorski M, et al. 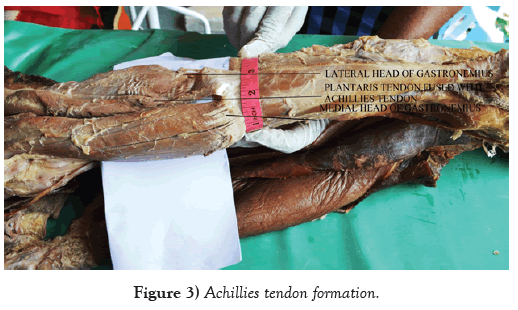 The plantaris muscle tendon and its relationship with the Achilles tendinopathy. Biomed Res Int. 2018;p:9. Helms CA, Fritz RC, Garvin GJ. Plantaris muscle injury: Evaluation with MR Imaging. Radiol. 1995;195:201-3. Andreo A Spina. External coxa saltans (snapping hip) treated with active release techniques®: A case report. J Can Chiropr Assoc. 2007;51:23-9. Moore KL, Dalley AF. Clinically oriented anatomy. Lippincott Williams & Wilkins, Philadelphia, USA. 2006;pp:648-9. Delgado GJ, Chung CB, Lektrakul N, et al. Tennis leg: Clinical US Study of 141 Patients and Anatomic Investigation of Four Cadavers with MR Imaging and US. Radiol. 2002;224:112-9. Hamilton W, Klostermeier T, Lim EV, et al. Surgically documented rupture of the plantaris muscle: A case report and literature review. Foot Ankle Int. 1997;18:522-3.